Size and design takes acquired taste, not as easily understood as classic timepieces that can be found within this price range. Possibly lesser than average value retention of the timepiece in real prices. Baselworld 2017, HYT does a retrograde and jumps from its latest H4 back to H0. The latest of its mechanical liquid watches at the most palatable price point since the brand started. The entry level collection has the same concept and movement as the H1 but with a reinterpreted dial and case design. 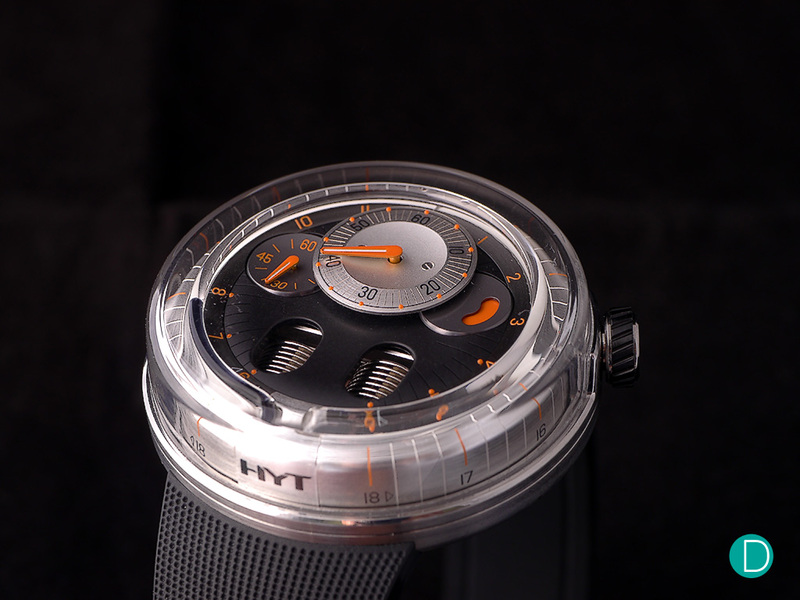 The new HYT H0 Orange in a brushed titanium case. The collection comprises three different models, Orange, Black and Silver. Each with varying dial colors and case material, but essentially the same design. At announcement, the timepieces were limited to 15 pieces each, but a subsequent price revision downwards also revised the H0 series to not limited. 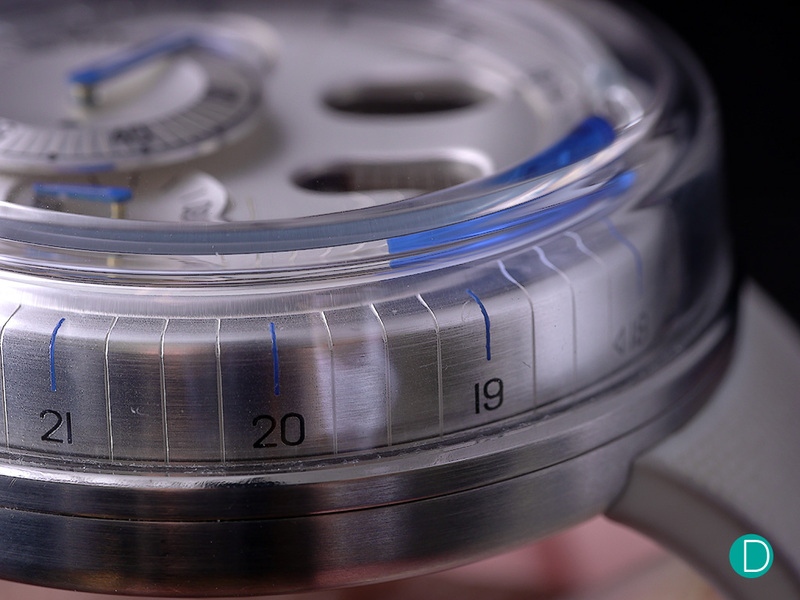 The watches are cased in titanium, and with different colour fluids to show the retrograde hours. The titanium case measures 48.8 mm in diameter, with a height of 17.9 mm. The watch as its predecessors, wears on the large side. At its side is a screw-down titanium crown for time adjustment and movement winding. The new case uses an eye-catching full domed sapphire crystal, without a bezel. An uncommon and likely difficult manufacturing feat, the case looks almost like a glass wrapped contraption. The case wears on the large side at 48.8mm in diameter. On its peripheral profile, minute markers climb the corner of the dial, for an unconventional thread marking. The domed or rather bent sapphire crystal, considering how steep an angle it curves at, slopes over a vertical leaning minute markers thread. The minute markers line the periphery of the watch. Akin to looking through a beaker of fluids in a lab, the visual effect of observing the liquid displayed time through the glass is certainly a quaint one. For those familiar with laboratories and looking through beakers may have an uncontrollable occupational hazard of holding the watch close and viewing the time on a ‘plane’ in the fear of parallax errors. 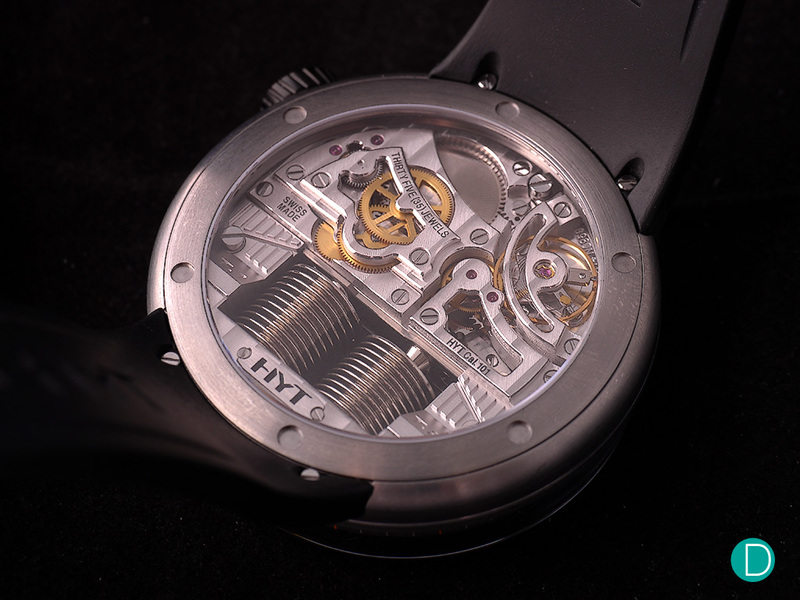 HYT’s mechanical manual winding movement, with the pair of iconic valves. The hybrid liquid movement beats at 28,800 bph, has 35 jewels and a 65 hour power reserve. The movement used is a mechanical manual winding caliber manufactured by HYT. The 35 jewels movement beats at 28,800 bph and has a 65 hour power reserve. 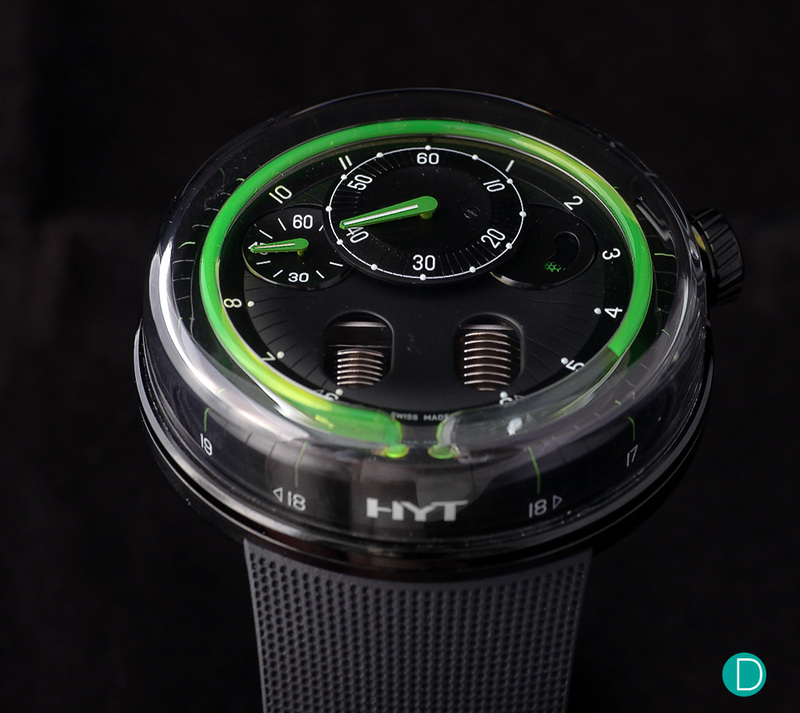 Renown as one of the forefront innovators in liquid mechanical movement display, HYT’s revolutionary caliber uses an exclusive patented micro-fluidic module to display the time. Two immiscible liquids; one transparent and the other coloured with a highly resistant dye are pushed through or retracted from within a capillary tube in medical grade glass. The rate of release or retraction is controlled by two multi-layer metal bellows, the dramatic focal point on both the front and back of the movement. 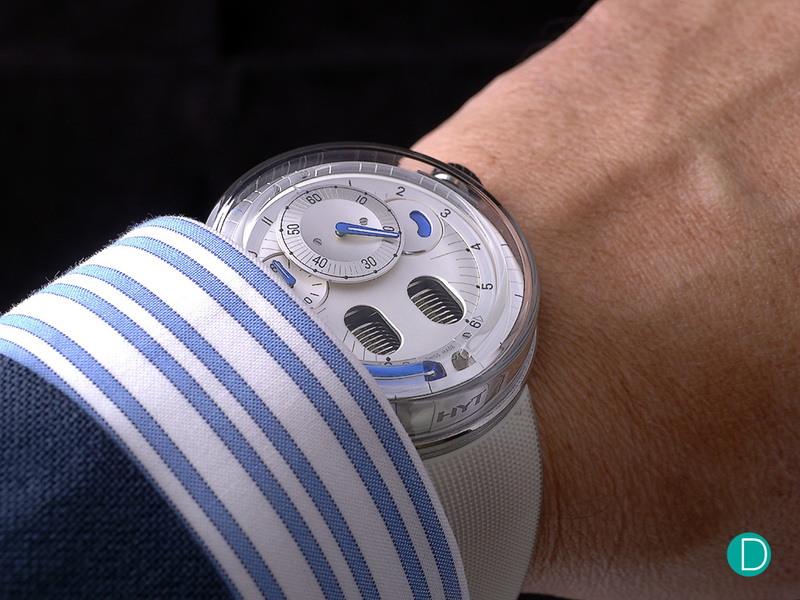 The HYT H0 Silver – on a white rubber strap, in the fitting realm of luxury sports timepieces. On the wrist and in real life the H0 looks and feels good. The watch reads like an open book that invites one to explore its intricacies. Retail price is S$ 55,000 with GST (Swiss retail is CHF 39,000 incl Swss tax). The H0 was initially released at CHF 55k/57k, but the prices were revised post announcement to CHF 39k. Other than the Colorblock (limited edition of 10 pieces in each colour, which retailed for the same CHF 39,000 also S$ 55,000) released last year, now sold out, this is the least expensive HYT in the market. Movement: Mechanical manual winding, 28,800 bph, 35 jewels, 65 hour power reserve. Strap: Rubber with titanium deployant buckle. Editorial note: April 17, 2017: Price updated with the revised price reduction of the H0, and update the status to a non-limited edition.